In the mid 1920s there was no more popular animal personality than Jo Mendi. 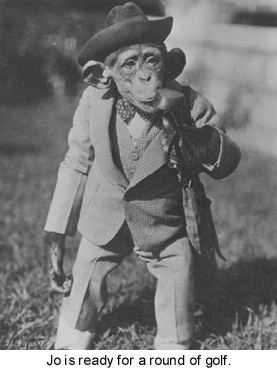 The talented chimpanzee was a star of Broadway, vaudeville and motion pictures and the center of attraction at the Scopes Monkey Trial. But by the time he was purchased by the director of the Detroit Zoo, Jo Mendi, was found used and abused, cowering in a damp basement. 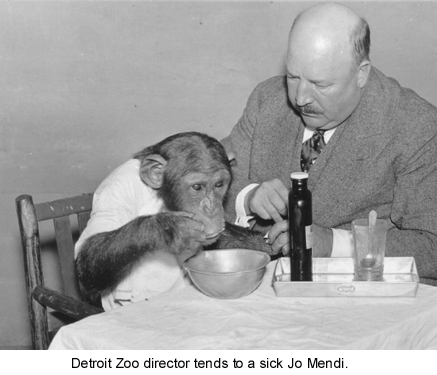 During the Great Depression Jo brought smiles to thousands of Detroiters and put thousands of dollars into the Detroit Zoo’s coffers. His death in 1934 made the front page of Detroit’s newspapers. All told, there were four chimpanzees named Jo Mendi. Here are their stories. In 1923, circus owner Lew Backenstoe purchased a three-month old chimpanzee that he named Jo Mendi from an animal broker in Cape Town, South Africa. Backenstoe, an old school circus showman, was an expert at ballyhoo- the art of promotion. He saw Jo as his claim to fame and his next meal ticket. 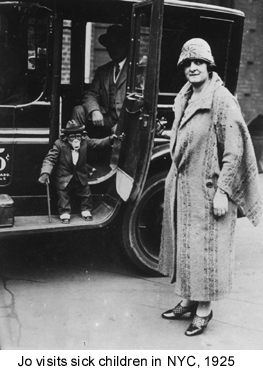 Backenstoe’s wife Gertrude Bauman trained the young chimp to perform many human-like tricks. In 1925, Bauman was ready to take the new act on the road. During the Hippodrome engagement Backenstoe announced that Jo would soon be en route to London, to be studied by the noted anthropologist Dr. F.G. Crookshank to “prove their theory that Darwin is right.” This set the stage for Jo’s next big appearance. On July 10,1925, the eyes and ears of the nation were focused on the small town of Dayton, Tennessee for what was deemed the “Trial of the Century,” the Scopes Monkey Trial. A handful of newsreel camera men, scores of telegraph operators, hundreds of print and broadcast journalists and thousands of curious onlookers gathered around the town courthouse as Clarence Darrow defended high school science teacher John Scopes for teaching evolution in his classroom while William Jennings Bryan argued for the prosecution. Time magazine described the proceedings as ”the fantastic cross between a circus and a holy war.” And holding court in the center ring of this media circus was an impeccably tailored Jo Mendi. The Scopes Trial was the first trial in American history to be covered by the broadcast media, a fact Backenstoe intended to take full advantage of. Gertrude Bauman put Jo thru his paces for the eight days of the trial. Dressed to the nines, he played his miniature piano on the sidewalks of Dayton, posed for countless photos, mugged for the newsreel cameras and even sipped a coke at the counter of Robinson’s Drug Store. Frank Robinson, the store’s owner, also happened to be the president of the local school board. Publicity like this couldn’t be bought at any price. Jo’s 1926 vaudeville tour was financed by a group of New York State bankers, and no expense was spared. A $100,000 life insurance policy was taken out on Jo thru Lloyd’s of London. A special automobile costing $50,000 was built to chauffer Jo around town in style. It was 38 feet long and could accommodate 150 people. Jo’s itinerary was always published in the local newspaper the day before he arrived. Backenstoe would cut a deal with local merchants for cash or merchandise in exchange for having Jo Mendi shop in their store. Jo always drew a crowd, which was a good deal for the shop owners and a great deal for the theater. Over the next two years, Jo Mendi and troupe toured the Keith-Albee and Orpheum vaudeville circuits, made a return engagement to the Hippodrome, appeared as an extra in a few Hollywood films and travelled across the country to appear in countless circuses and carnivals. As the interlocutor, Backenstoe worked up a cleverly fashioned spiel while Jo went thru his paces. His appearance at the Scopes Monkey Trial was always mentioned. “Jo Mendi was asked to appear, but he did not testify.” Jo had also added a few new tricks to his repertoire. The August 2, 1930 edition of Billboard Magazine reported “BACKENSTOE TO COLLECT $100,000 ON JO MENDI. Jo Mendi, headliner of the RKO Circuit, died at 7:30 this evening of ptomaine poisoning.” Jo became sick on the road several weeks earlier and proper treatment was never sought. It was later determined that Jo’s demise was actually caused by an abdominal growth. In death, Jo Mendi still made money for Lew Backenstoe. Jo’s body was skinned and stuffed for a travelling exhibit. 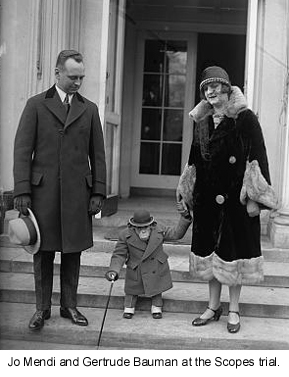 Jo Mendi II was on exhibition in an Indianapolis department store in December of 1930 when Irene Lee filed a complaint in Indianapolis Superior Court alleging that Backenstoe failed to keep his agreement regarding the purchase of the chimp. Lee located Backenstoe thru a detective agency and placed an attachment on Jo. Lee filed a replevin suit in February of 1931 when Backenstoe was discovered performing with Jo Mendi II at a Louisville, Kentucky theater. Backenstoe recognized the sheriff backstage and quickly skipped town with Jo before the law could take possession. He ultimately settled his debt with Lee, but Backenstoe’s legal troubles were far from over. Jo Mendi II appeared on Broadway from May thru July of 1931 in Billy Rose’s Crazy Quilt- A Musical Revue for 79 performances. The law caught up with Lew Backenstoe once again on October 10, 1931 when he was arraigned on a fugitive warrant in Chicago, charging larceny by bailee of $1,500 in conjunction with Jo’s earnings. The plaintiff in this case was Dr. Alfred Munson, a prominent Detroit dentist and Jo Mendi II’s new owner, who claimed that Backenstoe owed him $1,500. Munson filed a bill of sale at City Hall in Detroit, which detailed the sale of Jo Mendi II by Backenstoe to Munson in February of 1931. Both Backenstoe and Jo were held in a Chicago jail cell. Bond was set at $1,000. Munson took possession of Jo and brought him back to Detroit. He kept the chimp in his basement until he contacted Detroit Zoo director John T. Millen about boarding the animal. Millen offered to buy Jo for $1,000, then appealed to the City of Detroit for funds. With the country in the midst of the Great Depression and so many Detroiters in dire straits, the city council felt that it couldn’t possibly approve the sale. Millen paid for the chimp out of his own pocket. Millen created a stage show around Jo that entertained zoo patrons with as many as 14 shows a day. The admission charge was ten cents. It is estimated that Jo generated more than $30,000 in revenue during his three years at the zoo. When Jo became ill in the fall of 1932, the head pathologists from Grace and Herman Keifer Hospitals were consulted. Millen stayed by Jo’s bedside, feeding him medicine and broth until he recovered. He had hundreds of visitors and received more than $500 worth of flowers and several thousand cards and letters. The Jo Mendi Chimpanzee Theater was built in 1935 as a memorial to the beloved chimp. Four chimpanzees purchased from Jo’s earnings in 1933 were now the stars of the show. Jo Mendi II was purchased in 1945. This new Jo gave his namesake a run for his money. The Detroit News reported that Jo Mendi II could roller skate, walk a tightrope, ride a scooter, unicycle, bicycle and motorcycle, balance on stilts, roller skate and drive his own electric car. Jo was arguably the zoo’s most popular animal star. His photograph appeared dozens of times in the rotogravure section of Detroit’s three newspapers. 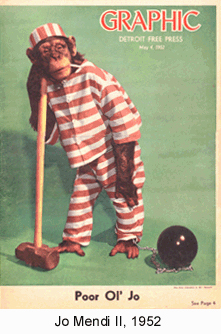 Jo was retired from the chimp show after eight seasons when he became too aggressive to work with. Unlike other chimps that were retired and sold for research after five to eight years, Jo lived the rest of his days as the zoo’s “trained chimp emeritus.” Popular Detroit TV weatherman Sonny Eliot regularly visited Jo to bring him cartons of cigarettes. Jo died in 1980 at 38 years of age. The chimp shows continued at the zoo until 1983, when Zoo Director Steve Graham deemed the shows cruel treatment of the animals. The Jo Mendi Theater was dismantled and a new four-acre habitat called Harambee was created. It was the most naturalistic habitat of any chimp exhibit in the world. A fourth chimpanzee named Jo Mendi was one of six adult chimpanzees donated by The Detroit Zoo in 1991 to the John Ball Zoological Garden in Grand Rapids, MI. Jo was the alpha male among the tribe. He died in 2005 following what was supposed to be routine dental work. Jo was 26. After Lew Backenstoe lost Jo Mendi, he operated the Gorilla Villa at the 1933-34 Chicago World’s Fair. He retired from show business in 1936 and died of congestive heart disease in 1937. Detroit Zoo director John Millen kept Jo Mendi’s ashes on a shelf in his office. . Millen retired from the zoo in 1944 and died in 1956.